Are you having a difficult time selecting the best Dutch oven? Do you feel a tad overwhelmed? Don’t worry about that. Dutch ovens have a long history and have existed for centuries. Over time, innovators have improved their designs thus creating lots of choices. Finding the best one is easier than you think, with the right information. The best Dutch oven means the best one for you. It doesn't matter how great, or how high quality, a kitchen gadget or pot or pan is -- if it doesn't suit your needs, you'll never use it. A Dutch oven is one of those things that if you choose the right one, you'll never be able to figure out how you lived without it. They're versatile, sturdy, and can last a lifetime. Some can go from the lake to your kitchen with ease, others are specialists in either indoor or outdoor cooking. There really isn't a limit to the usefulness of this largely overlooked but amazingly handy pot. You probably already know that Dutch ovens are cooking pots with thick walls and tight-fitting covers. But there is more to them than that. And understanding other characteristics of this cookware will help you to choose wisely. It's worth understanding these awesome cooking vessels. Two significant types of Dutch ovens exist. Their design and purpose are somewhat different. The Dutch ovens for camping are often made of cast iron. Some are mostly aluminum. These are quite popular for outside use due to their design. Many of them have three legs that allow the oven to be raised over the campfire coals. They also have a tight-fitting, recessed lid designed to hold hot coals to ensure proper cooking of the food within the cookware. Modern Dutch ovens are flat bottomed. They do have a tight lid like their campfire counterparts which, is not necessarily recessed because they are designed for indoor use. The materials used to make them vary. It includes cast iron, aluminum, ceramic, and enameled metal or ceramic. Dutch ovens are used for a variety of cooking tasks. You can use them to bake, stew, and fry your food. These pots are safe to use in your oven and on the stovetop. Not to mention they're great on open campfires. Due to their ability to retain heat, Dutch ovens are also excellent for making casseroles, roasts, and stews. Anything that requires slow cooking will actually do well within these ovens. Before you select the best Dutch oven, you need to consider the right factors. Here are some of the criteria you can use to choose the best Dutch ovens for your needs. Where you plan to use the Dutch oven the most determines which one you should get. If you want something for the outdoors, then consider the ovens with the stubby toes. It will be convenient. A flat-bottomed Dutch oven is a much better option for regular indoor use. Those for use in the kitchen may have ovenproof handles for easy insertion and removal from your oven. Also, make sure the walls are thick enough, and the lids fit correctly. There should be no cracks on the oven surfaces. The shapes vary with some being round and others oval. Round Dutch ovens are better for stovetop cooking. Are you willing to expend some effort in maintaining your Dutch oven? If not, you may want to avoid the cast-iron Dutch ovens. They are some of the best around, but you need to season them before you use them for the first time and after each use. The care required is the same as that for cast-iron frying pans. You'll need to hand wash them, heat them, then coat them with oil, and store the oven well after use. Enamel ovens are much easier to clean and require less maintenance. How many people do you intend to feed on a regular basis? Your cooking needs will determine the size of your Dutch oven. Try and buy larger Dutch ovens if you want to cook for many people. The size is usually measured in quarts and varies from 2 to 14 quarts. Read through customer ratings and reviews to ensure that the best Dutch oven you are thinking of selecting is functional in reality. That will save you lots of money in the future. 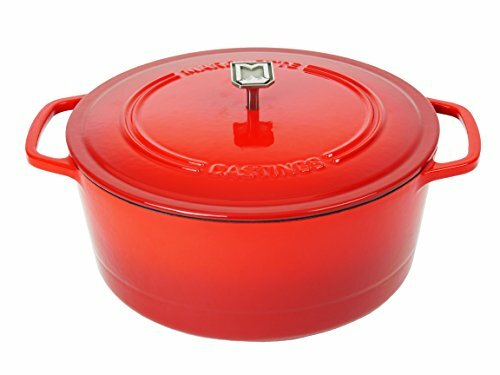 The best Dutch oven prices vary depending on size, type of material used to make it, brand reputation, and whether the cookware is new or used. These ovens vary from $$ on the low end to $800 on the higher end. You can find something to suit your budget. To determine the best Dutch oven for your needs, we considered the design, cost, and size. We also thought about the materials used to make the oven, the brand, and customer testimonials. The following are our choices for the best Dutch oven. Our goal was to find something to suit a wide variety of budgets, design tastes, and cooking needs. 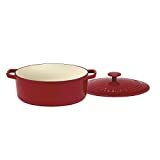 This Dutch oven is one of Amazon’s choice products. It’s enameled oven with a cast-iron core. That gives it the excellent heat distribution qualities of the metal but none of the maintenance complications. The Dutch oven has a tight-fitting cover, and loop side handles for easy carrying. It comes in blue, green, and red. This particular Dutch oven has a 6–quart capacity. It’s heavy duty and oven safe and can withstand temperatures of up to 400 degrees Fahrenheit. You can use it for multiple cooking functions such as roasting, baking, and even food storage. It comes with a limited one-year warranty from Amazon. On Amazon, this Dutch oven has a rating of 4.6 out of 5 stars. It costs $$ to $$. Customers love it because it is low maintenance, is affordable, and retains heat well. However, some customers complain of defective ovens that came with chipped enamels and rusty parts. This camp Dutch oven has a 5-quart capacity, which is a decent size for up to six people. It is made of cast iron, which is sturdy, and durable when well-seasoned. The cast iron is also excellent in distributing heat which makes this oven the best option for outdoor cooking. The Lodge Dutch oven has a recessed lid for proper and convenient placement of coals. This multifunctional lid can be inverted and used as a griddle. It also has a metal handle for easy removal or placement of the oven over the campfire. Its three legs also ensure that you can raise it over hot coals. Besides that, this particular Dutch oven comes pre-seasoned. On Amazon, this oven has a rating of 4.7 out of 5 stars. It costs $$ to $$. Customers love it because it provides excellent value for the money, is of good quality, and comes pre-seasoned. However, some customers complain of defective ovens with cracks, some of which are poorly seasoned, and others with rusty parts. This round Dutch oven has a capacity of 7.25 quarts. That makes it large enough for about 8 to 10 people and is thus an excellent option for large families. It is enameled and has a cast-iron core. That improves its heat retention qualities while being easy to clean. The interior of this oven has sand-colored enamel, which withstands wear and tear better. Its well-fitting lid has a composite knob that can withstand temperatures of up to 500 degrees Fahrenheit. Besides that, the oven has large side handles that make it easy to carry with oven mitts. On Amazon, this Dutch oven has a rating of 4.8 out of 5 stars. It costs $$$ to $$$. Customers love it because it retains the heat exceptionally well, looks attractive, is easy to clean, and is non-toxic. Some customers, however, complain of defective ovens with enamel chips and cracks. The Cuisinart Dutch oven has a porcelain enamel and cast-iron core. The coating is non-toxic and does not react with foods nor impart flavors. It also doesn’t absorb food odors. The cast-iron inner body helps to ensure even heat distribution and retention. For this reason, this casserole dish is sturdy, durable, and dishwasher safe. 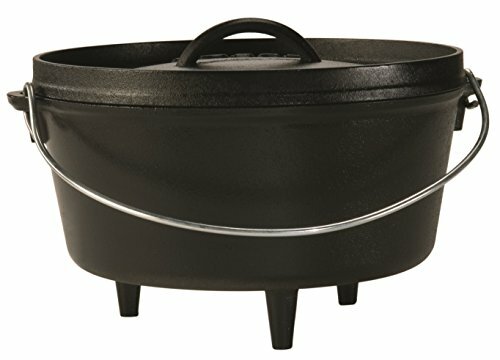 The oval-shaped Dutch oven has two large handles on each end to allow for easy transportation. The knob is oven safe also is therefore durable. It’s stylish color, finishing, and design makes this casserole dish excellent not just for cooking but entertaining. At 5.5 quarts, this Dutch oven offers a decent size that can accommodate about six people. On Amazon, this oven has a rating of 4.3 out of 5 stars. It costs $$ to $$. Customers love it because it can withstand higher temperatures, offers excellent value for the money, and has a stylish design. However, one outstanding complaint is that some of the ovens had chipped enamel coating. 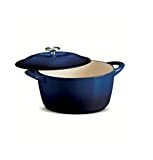 The Tramontina Dutch oven has a blue enamel coating that covers a cast-iron inner body. It’s therefore stylish, easy to clean, sturdy, and durable. The cast iron core also enhances heat distribution and retention. You can use it for slow cooking and baking. This Dutch oven has a 6.5-quart capacity. That makes it large enough to accommodate 8 to 10 people. The sides have a handle each for easy transportation. Also, the oven comes with a tight-fitting lid that has a stainless steel knob capable of withstanding temperatures up to 450 degrees Fahrenheit. And the lid interior has self-basting condensation ridges that help to keep moisture in the food. On Amazon, this Dutch oven has a rating of 4.6 out of 5 stars. It costs $$ to $$$. Customers love it because it is sturdy, provides excellent value for money, and is comfortable to clean. However, some customers complain of defective ovens whose enamel coating chipped and peeled off within a short time of use. This Dutch oven has an aluminum inner core. The material is lighter than cast iron and thus makes this oven much easier to carry. It also heats up faster. Besides that, it is sturdy and durable. Additionally, the cookware has a coating of Ceramtec ceramic. It is thus nonstick, easy to clean, and compatible with all stovetops. It’s also oven safe. The aluminum Dutch oven has a 5-quart capacity, which makes it a good fit for up to 6 people. Its lid has double lips that help to seal in moisture thus ensuring natural food basting and flavor retention. There is also a valve that regulates the amount of steam within the oven. On Amazon, this Dutch oven has a rating of 4.6 out of 5 stars. It costs $$ to $$. Customers love it because it is easy to clean, has a high-quality construction, and has a provision for steam venting. However, some customers complain that the coating is not scratch resistant. 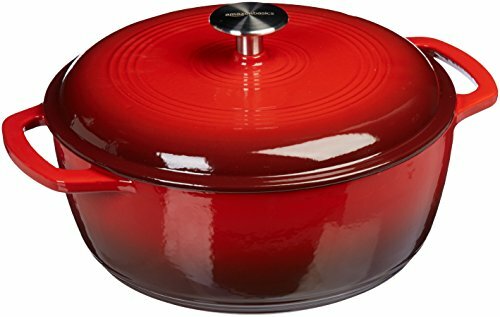 The gray Dutch oven is made of enameled cast iron thus making it low maintenance. It has a high-gloss interior that enhances its simple but stylish design. The bottom is completely flat for use on induction cooktops. 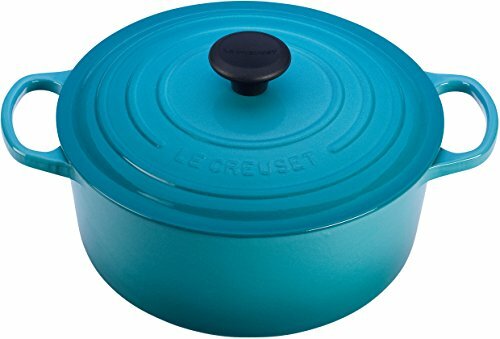 This Dutch oven also comes in matte white, iron red, and superior blue. With a 6-quart capacity, this Dutch oven can accommodate about 6 to 8 people. Its loop handles enable you to grip them with oven mitts when necessary, for easy transportation. Besides that, it's oven safe and can withstand temperatures of up to 500 degrees Fahrenheit. It also comes with a lifetime warranty. On Amazon, this oven has a rating of 4.6 out of 5 stars. It costs $$ to $$. Customers love it because it provides excellent value for the money, is easy to clean, and has a lifetime warranty. Some customers, however, complain of defective products with chipped enamel coating. The best Dutch oven your money can buy may end up being one of the best decisions you ever make. It will be an excellent addition because it's capable of replacing multiple cookware. So take the time to find one that is the right size, and design, and which offers the most suitable functionality without exceeding your budget.